Results: Though considered a promising large-scale energy storage device, the vanadium redox battery's use has been limited by its inability to work well in a wide range of temperatures and its high cost. But new research at Pacific Northwest National Laboratory indicates that modifying the battery's electrolyte solution significantly improves its performance. So much so that the upgraded battery could improve the electric grid's reliability and help connect more wind turbines and solar panels to the grid. In a paper published by the journal Advanced Energy Materials, the researchers found that adding hydrochloric acid to the sulfuric acid typically used in vanadium batteries increased the batteries' energy storage capacity by 70 percent and expanded the temperature range in which they operate. Why It Matters: Unlike traditional power, which is generated in a reliable, consistent stream of electricity by controlling how much coal is burned or water is sent through dam turbines, renewable power production depends on uncontrollable natural phenomena such as sunshine and wind. Storing electricity can help smooth out the intermittency of renewable power while also improving the reliability of the electric grid that transmits it. 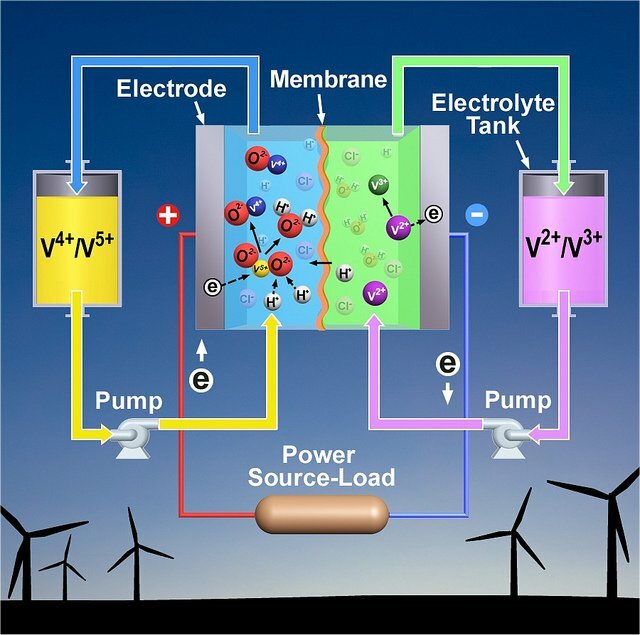 Methods: A vanadium battery is a type of flow battery, meaning it generates power by pumping liquid from external tanks to the battery's central stack, or a chamber where the liquids are mixed. The tanks contain electrolytes, which are liquids that conduct electricity. One tank has the positively-charged vanadium ion V5+ floating in its electrolyte. And the other tank holds an electrolyte full of a different vanadium ion, V2+. When energy is needed, pumps move the ion-saturated electrolyte from both tanks into the stack, where a chemical reaction causes the ions to change their charge, creating electricity. Wanting to improve the battery's performance, Li and his colleagues began searching for a new electrolyte. They tried a pure hydrochloric acid electrolyte, but found it caused one of the vanadium ions to form an unwanted solid. Next, they experimented with various mixtures of both hydrochloric and sulfuric acids. PNNL scientists found the ideal balance when they mixed 6 parts hydrochloric acid with 2.5 parts sulfuric acid. They verified the electrolyte and ion molecules present in the solution with a nuclear magnetic resonance spectrometer and the Chinook supercomputer at EMSL, DOE's Environmental Molecular Sciences Laboratory at PNNL. What's Next: The results are promising, but more research is needed, the authors noted. The battery's stack and overall physical structure could be improved to increase power generation and decrease cost. Acknowledgments: This research was supported by DOE's Office of Electricity Delivery and Energy Reliability and Laboratory Directed Research and Development funding. The research was done by Liyu Li, Soowhan Kim, Wei Wang, M. Vijaayakumar, Zimin Nie, Baowei Chen, Jianlu Zhang, Guanguang Xia, Jianzhi Hu, Gordon Graff, Jun Liu, and Zhenguo Yang. Key research was done in EMSL, a national scientific user facility at PNNL. Reference: Li L, S Kim, W Wang, M Vijaayakumar, Z Nie, B Chen, J Zhang, G Xia, J Hu, G Graff, J Liu, and Z Yang. 2011. 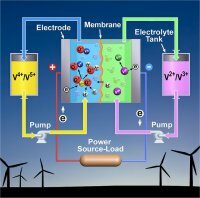 "A Stable Vanadium Redox-Flow Battery with High Energy Density for Large-Scale Energy Storage." Advanced Energy Materials 1(3):392-400. Published online March 11, 2011.